Dip Mix Ornaments are such a fun and unique edible Christmas gift idea! These mixes are easy for the recipient to make with just a couple of ingredients. Make them for everyone on your Christmas list this year! I love giving unique and unexpected gifts at Christmastime. 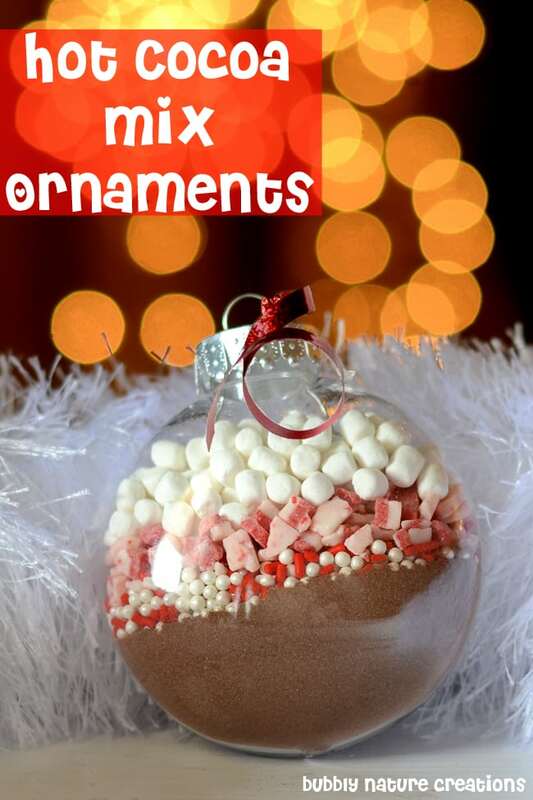 Last year I showed you how to make Hot Cocoa Mix Ornaments and everyone loved them. This year I thought of these Dip Mix Ornaments! I think these are perfect to box up and give to someone at Christmas! Where to find ornaments for filling. I bought mine at Hobby Lobby in 2013 and they are craft ornaments. They were glass and the lid had a hole in it. Now Hobby Lobby has plastic screw top lid ornaments that are perfect for this gift idea! See the picture below of what they look like. I have an alternative if you don’t have a Hobby Lobby, but they have regular lids and you’ll need to put a piece of foil or plastic to cover the hole. My suggestions for ornaments if you can’t get them from Hobby Lobby. I suggest trying these non-breakable fillable ornaments here: (Amazon affiliate link) These ornaments are bigger than the ones I used so make MORE dip mix to put in the containers if you want them filled to the top. These are significantly bigger (around twice as big) and I just want to stress that before you buy them! Use a funnel to fill each ornament. This is an important step because the tops of the ornaments are very small. If you don’t have a funnel use a piece of paper rolled into a cone shape and use that as your funnel. 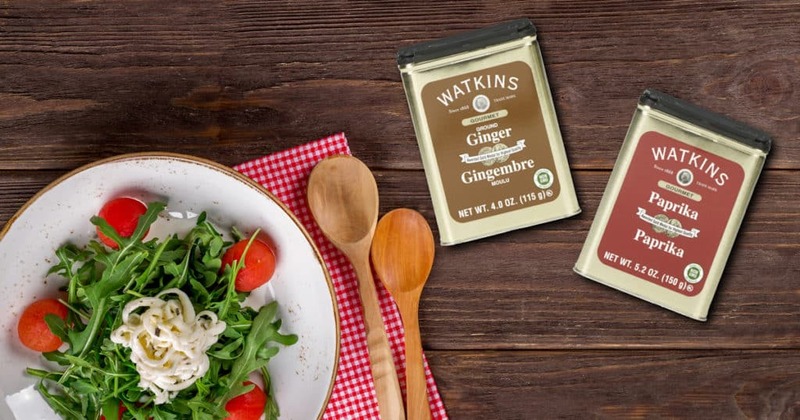 Use Watkins Spices or McCormick. 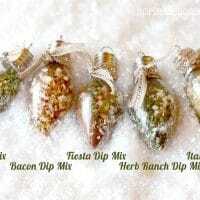 Many of the questions I get asked about dip mix ornaments has to do with the spices I used for my own ornaments. Different spice/herb companies will have a different grind sizes. Dried herbs like parsley may have bigger particles or smaller particles which will affect how much you are able to put into each ornament. I like that I can order larger sized tins of Watkins spices when I am making the dip mix ornaments in bulk. These dip mix ornaments are ready to be boxed up for a someone special! I like wrapping them up in a little box or basket that is lined with tissue paper. Dip Mix Ornaments should definitely be on the list for any foodie in your life. All that you need to add is a gift tag with the instructions on how to make them. You can do this on your own or print out the FREE pdf I have included for my subscribers. 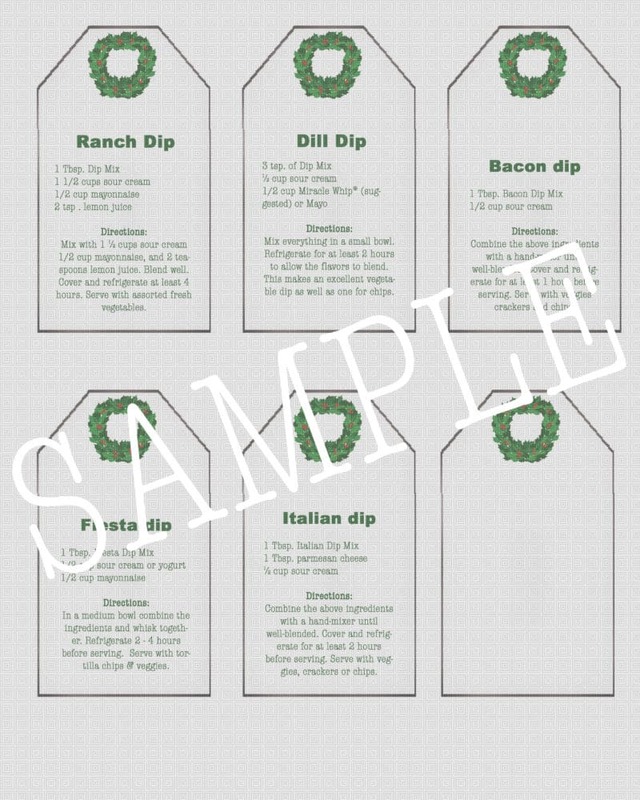 The pic above shows an example of the printable for the dip mix ornaments. The actual printable is not gray this is just the example of what you will get. Just print the gift tags out on card stock (preferably) and punch a hole through the top in the middle of the wreath. Put a piece of string or ribbon through the hole and tie onto each ornament. Get your FREE printable and join our community. If you have any trouble getting the printables try looking in the spam folder on your email for the confirmation link. The Hot Cocoa Ornaments were the original edible ornament idea and they are great for kids and adults alike. Click the link above to find out all the suggestions on making them for your friends and family. 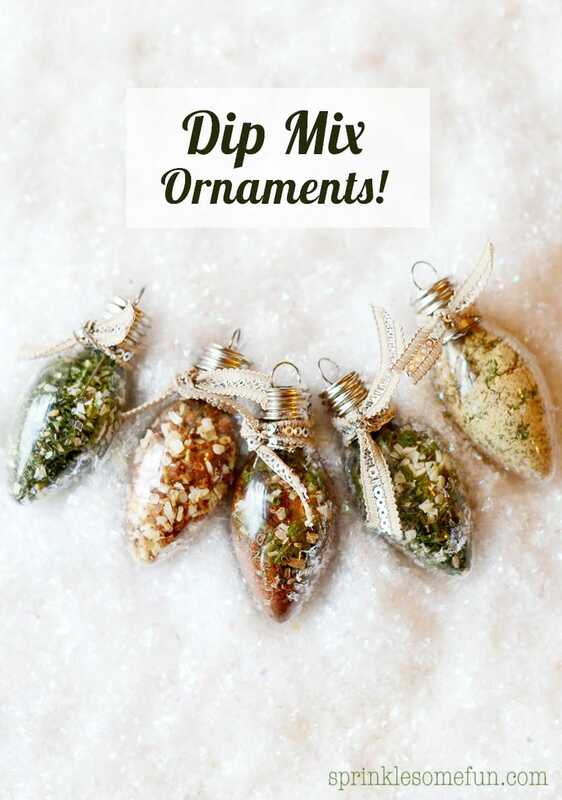 My friends and family raved about these dip mix ornaments when I handed them out and they loved the dips made with them. These are perfect to hand out in the office, as a hostess gift or as a parting gift for a Christmas party. If you love this recipe and creative ornament idea please give us 5 stars below! In a medium bowl combine the ingredients and whisk together. Refrigerate 2 - 4 hours before serving. Combine the above ingredients with a hand-mixer until well-blended. Cover and refrigerate for at least 2 hours before serving. Serve with veggies crackers or chips. Combine the above ingredients with a hand-mixer until well-blended. Cover and refrigerate for at least 1 hour before serving. Serve with veggies crackers and chips. Mix everything in a small bowl. Refrigerate for at least 2 hours to allow the flavors to blend. This makes an excellent vegetable dip as well as one for chips. Herb Mix Dip: mix with 1 ½ cups sour cream 1/2 cup mayonnaise, and 2 teaspoons lemon juice. Blend well. Cover and refrigerate at least 4 hours. Serve with assorted fresh vegetables. Mix spices and fill ornaments with mixture using a funnel. If you are using bigger ornaments than the ones pictured (these are around 2 inches in height and 1 inch diameter) then you will need to make even more spice mix for each ornament to fill them up. The amount needed will vary depending on the ornaments you use. If using the 4 inch ornaments I placed a link to... I would triple the spices for each. The gift tags include exact measurements for making the dips so just make as much needed to fill the ornaments and include the gift tag. Before closing the ornament wrap a small piece of foil at the opening and then put the ornament top back on. The metal wires will puncture through the foil, but should not leave a big hole to where the spices will come through. Shake each ornament a little to see if your foil has a hole... if the contents remain then you are good... if not then repeat the foil process. Place a card with each ornament with the directions on how to make each dip. I have printable directions in cute gift tag form for your convenience! I love this idea! This would be great for a housewarming gift too! Thanks, Kristy! Great idea for the housewarming! I’m making these as Christmas Gifts for my children’s teachers. Has anyone tried the dips? How do they taste? I made the dill tonight and have it chilling but was wondering if anyone else had any experience with taste for any of the dips. I know I am the writer of the recipes so obviously I like the taste of them. Maybe someone else can chime in too. I hope you like the Dill dip! My fave is the Fiesta and Herb Ranch Dips. My only question is I had to use bigger bulbs and now in writing the dip directions, how much dry mix should I say to mix in with the other ingredients? A TBSP? OR “to taste”?? Thanks for any input – I LOVE this idea and I found the cutest baskets that the fit into perfectly. My daughter is having a Christmas wedding I think they would make great favors. I love this idea and am eager to make it! I subscribed for your newsletter, but can’t seem to figure out how to access the PDF for the printable tags….any help would be appreciated! Thanks! I did too and it won’t let me get the printable tags! Any ideas? Same! I’ve done it twice already. Have you guys gotten it yet? Is there a printable tag with the recipes for these dip mixes? Has anyone gotten the tags yet?? I signed up for the emails twice and still never received them. Thanks! I adore this idea… the kids can help assemble them too with the herbs they have dried from our garden. Great idea! I will definitely being using this idea for holiday hostess gifts along with a bottle of wine! Sounds great, Jodee! Thanks for stopping by! You are a genius! This is quite possibly the most wonderful gift giving idea for the most wonderful time of the year! Ahh… thanks, Meme! Have fun making them! Hi. How much mix does each “bulb” ornament hold? Thanks. I was able to get in around 2 1/2 Tbsp. of the spices. Thanks Rachel. Have a Happy Thanksgiving. Hey! These are super cute and we are making a batch right now. I have a question about step 3. How did you instruct the recipients to make the recipe? Since the recipes have different ratios of spices to sour cream/mayo and we are putting 2.5 TBS in each bulb, how much added ingredients did you instruct the recipients to add to create the dip? For example, we put 2.5 TBS of the dill dip in the bulb.The recipe calls for 2.25 tsp of spices. How do we create the dip? I have not been able to even get 2 Tbs. into the bulbs…any helpful hints? I have the correct size or ornaments. This is just a fantastic idea. But, I can’t seem to locate the bulbs anywhere. and, how many come in a pack and how much? Thanks for your creative mind and for sharing!!! 6 Bulbs come in a pack and I found mine at Hobby Lobby. I think the mini small balls would work also if you can’t find the ones shaped like lights… the ingredients may need to be adjusted though. Hope you can find some! Hi love this creative idea, I ran to hobby lobby all I could find were ornaments 4 1/2 inches long. Those are larger than yours aren’t they? Thanks! Yes. Mine are only 2 inches long at the most. I think the mini small balls would work also if you can’t find the ones shaped like lights… the ingredients may need to be adjusted though. I CAN’T FIGURE OUT HOW TO COVER THE TOP SO THE DIP DOESN’T COME OUT. You could always put a small piece of tape over it if tin foil doesn’t work. Ok, I tried my own suggestion (to use tape) and that didn’t work very well. The tinfoil suggestions didn’t work very well either. Does anyone else have any ideas on how to prevent leakage from the top of the ornament? These are the cutest things ever! I’m new to your blog and love it. I found you on Pinterest. What a cute idea! Are you talking about thin glass Christmas tree ornaments – or hopefully, something sturdier? I would worry that the edges of a Christmas ornament might chip off, unnoticed, and be swallowed. thank you Rachel for such a lovely idea, this solves a dilema I had for a Christmas Gift. I found your idea on the Baking Hot Christmas Facebook Page! 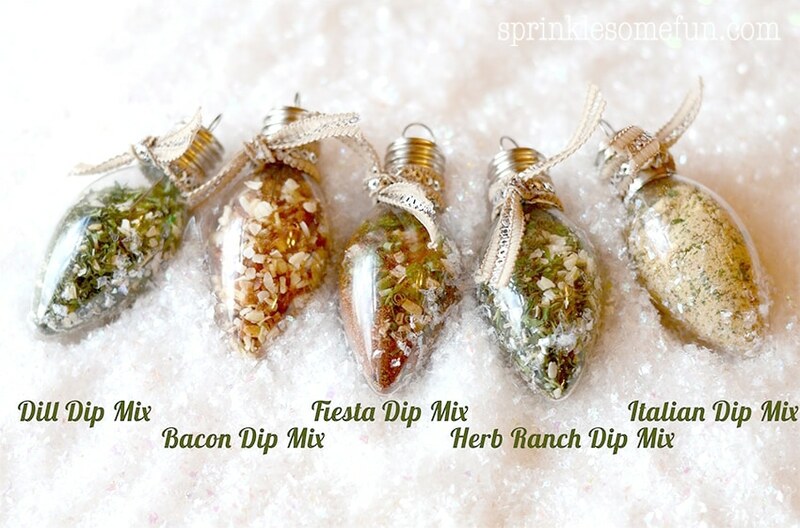 Such a cute idea but I am wondering, do you have to refrigerate the dips ornaments with parmesan cheese and bacon bits?? What am I missing? 4 of my dip mixes look just like your BUT my Italian one is only half full & doesn’t look anything like yours. Are you putting the parmesan cheese in the bulb instead of having them add it later? If so, that would then look like yours but the label recipe would be incorrect. HELP! I am making MANY sets for giving right now. The original bulbs were filled with the parmesan cheese, but I changed the recipe to exclude it from the mix since it might go bad if left for too long. If yours are not filled up all the way then just make more mix. The recipe will be the same since I used actual measurements of the mixes for the recipe. So when making the recipe you would measure out 1 Tbsp. of the mix along with the rest of the ingredients. I hope that helps. I was wondering the same thing if the parmesan cheese and bacon bits need to be refrig??? what department did you find the clear plastic ornaments at Walmart? we went to one today and couldnt find any clear ornaments at all. I bought glass ones at AC Moore and then realized they were too big and could break once the weight one the ingred, was put inside if it. For those of afraid of the glass ornaments…. I found the hard plastic ones that look like just like these glass bulbs at JoAnn’s. They’re quite a bit more expensive even at 40% off. How is everyone else sealing the opening at the top to keep the dip ingredients from spilling back out? LOVE this idea! I used a dab of hot glue & it worked perfect. I sealed them with the wire in tact then filled them that afternoon. I made 26 sets. OMG! These are the most wonderful, original idea I’ve seen this year! Kudos! I will definitely be trying. You have a new fan. I will be closely following your site. Going to go check out older posts now. BTW I discovered you through Pinterest. Thanks again for sharing this great idea. I love your idea but don’t live near a Hobby Lobby 🙁 . However, I have friends that live near the one near by Quakerbridge Mall in Lawrence NJ. They will pick them up for me as I am visiting them on December 8th. Is there an identifying number on the packaging because I couldn’t find them online. I am not sure about a number, Donna. I know the box says Make it Christmas and each ornament is 2 3/8 inches. Hope that helps and you are able to find them! Thanks! Thanks for such a wonderful idea. I am fixing to get ready to head to Baton Rouge to Hobby Lobby. I am so excited. This will make great gifts for the people at work. Thank you so much for sharing this wonderful idea. I made some of these tonight with friends. I found the measurements on the fiesta a bit odd (half a T. as opposed to 1 1/2 tsp), etc, but after a little trial and error, the ingredients fit okay. We had to reduce slightly on the italian and pack half way with a skewer, but made it work. All in all, they are really cute. I think the variation may stem from slight variances in the spices/herbs used. Thanks for the idea!. How cute!!! I love this idea! What an awesome gift idea, and I love that it’s so practical too because there’s never enough dip for snacking around the holidays! 🙂 Love this!!! Love this idea. I had leftover card holder ornaments (1.57 in) and gave it a shot to see if the ingredients would fit. I tried it with the ranch herb dip ingredients and it worked!!! There was room so all other recipes would work. What’s nice about this one is it is flat on the bottom and you can print out cards with the recipe on it and put it in the holder of the ornament. I’m going to put them at each plate setting for Christmas dinner. I’m going to attempt to look for the light bulb ornaments so people can just grab that when they leave but I wanted a back up in case I couldn’t find them. You can get the card holder ornament in a box of 12 for $7.99 at Joann’s. What is a card holder ornament ? Checked the website but nothing came up. Oriental Trading Co has these right now, plus it’s been free shipping on any order amount. $6.25 for a dozen and they are plastic. Does the plastic ones open up easily and seal back up? They don’t have the top opening like the glass ones. Hi there- Is it possible to make a large batch of the dips if doing several of each kind? Or do you need to funnel the ingredients in, per the recipes above, one ornament at a time? It should work just fine if you use the exact ornaments I used. 1) i am against Hobby Lobby’s so called Christian policies that discriminate against non Christian people and women’s rights.. but it’s fine that they purchase their stock from slave labour and very inhumane China, where forced abortions and other abuses are okay..
2) Hobby Lobby does not ship to Canada… maybe there are too many Heathens here..
I’m trying your dip mixes (what a cute ideal for Christmas gifts). I have a question on Fiesta Dip, you have 1/2 T which I’m assuming is 1/2 Tbps, and 1/4 T is that also a Tbsp? Yes, That is Tablespoon so 1/2 Tbsp. would also be equal to 1 1/2 tsp. Going to fix the recipe to reflect that. Thanks. Our Hobby Lobby is out of the 2 3/8″ bulbs and I was told they would not be ordering any more. Has anyone else had good luck with bulbs from anywhere else?! Thanks! What a great idea! I’ve been looking for a gift idea for the nurses taking care of my mom and these are perfect. I do have a question about the bacon dip recipe, the minced onion and garlic, is that fesh onion and garlic? Hi Linda! The minced onion and garlic are dried and found with other spices. The brand I used was McCormick. I just made these with small round glass bulbs, they are going to be even cuter once I make fancy tags and bows! Love this! I found plastic light bulbs at JoAnn’s Arts and Crafts, and they were on sale as well…..they were a little larger than a standard Christmas light bulb – being plastic you don’t have to worry w/taping around the neck to keep glass ones from chipping. Questions on dip recipes ….. Bacon Dip – minced onion, minced garlic – is this dried mined onion and dried minced garlic? Italian Dip … the parmesan cheese – real parmesan cheese or is there a dried? Wouldn’t this need refrigerating if it’s the real cheese? I just adore this idea! So creative and different from all the other homemade gifts! I am litterally in the process of making my gifts for this year, but can’t wait to do this for next year! What a great idea! I found plastic ornaments at Michaels so there is no worry of glass fragments.Can’t wait to try the recipes. Thanks! This is such a great gift idea! I hope I can still find the ornaments. I’d love to do this for a party I’m having next week. Found you on Pinterest. For the bacon dip mix, do you mince a fresh onion or is there dried minced onions? same for Garlic? I absolutely love this idea!!!!! Wish I would have seen it sooner. Fantastic gift idea. Would you post the link to the refillable glass light bulbs? I can’t find them on the Hobby Lobby site. I don’t have a store near me. Thanks much! Can we sell these at craft fairs? Hi Linda! Thanks for asking. You may do whatever you want with them! I post my tutorials for inspiration. Of course I love it when people send me pics of their final product so I can share them with my audience, but it’s not necessary that you do that! I love these ornament ideas!!! Thank you for the idea!!! These are so cool. I’ve already got a list of people who are getting them for Christmas. Thank you so much for sharing. I was wondering how you get the metal top off the bulb to fill, that can’t be ease to do. I did not notice any one ask that question. Hi Connie, these are ornaments so the tops came off real easily. In love with this idea, making them for several Christmas gifts this year……question, do you think a 4 ounce Ball jar would be big enough to hold the mix? Is the recipe written to fill one bulb? Has anyone been able to find any 2 3/8 bulbs? And if so where? Is 2 3/8″ the total length of your light bulb ornament? Haven’t been able to find these. Found ones at Joannes. Just the part of the bulb that you fill is 3″ long. I’m guessing they will be too big. Thanks!! Was not sure if they would be to big or small? Or would these be better? This is a fantastic idea for a gift, but by only adding between a 1/2 to 1 cup of the additional ingredients it doesn’t seem like it would make very much. Is this recipe just a single serving? in the little light bulb. 1 Tablespoon of Parmesan with the spices I found all that to be too much for the little ornament. Should it be 1 teaspoon Parmesan? 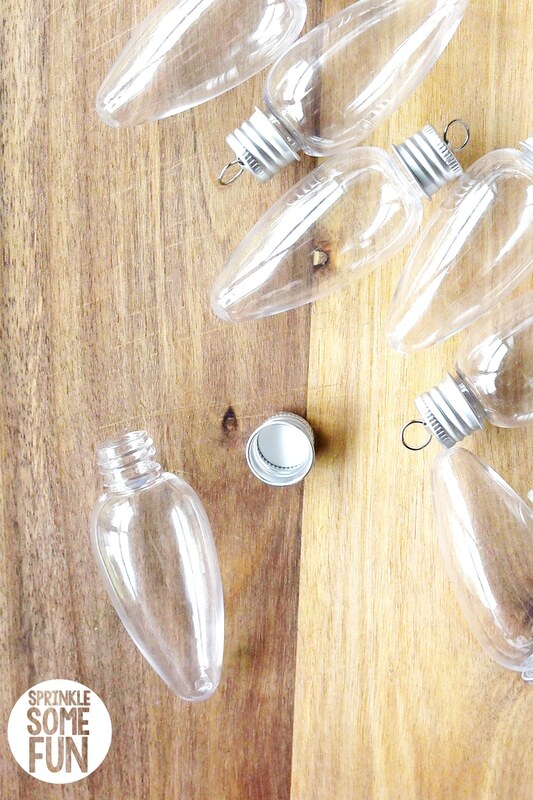 Do you recommed glass or plastic bulbs? Which are food safe? And which do you use? Hi Shylon! I used glass for these and they are from Hobby Lobby. I am not sure if they are food safe or not, but just wanted to suggest it for those that are worried about the safety of regular ornaments. I use these tutorials for inspiration. Hope that helps. This is such a great idea! Cute and useful – love it! Pinning to remember! I just found the light bulb plastic ornaments at Joann’s last weekend. They were past the Christmas aisle, in the section where you can find items for Christmas crafts. I got my mom a mini crock pot for Christmas and I have been looking for something like this to make like a cute little gift basket out of. Do you think these dips would be good warmed? Hi! These are great and I made the Italian Dip Mix and Ranch herb. I was wondering though about the additional ingredients added. The Italian only has 1/2 cup of sour cream, but the Ranch has 1 1/2 cups sour cream and also 1/2 cup mayo. I was surprised that there was such a difference – 1/2 cup for one and 2 cups for the other. Is this correct?? Thanks!! Yes that is correct. Not all the mixes make the same amount. If I wanted to give more of each dip and put in a jelly jar would I just double the recipe? What a cute idea. I love gifts that are useful and pretty at the same time. I know this is an older post, but I love this blog and am thinking of making these Ornaments to hand out…Is there any type of printable to attach to tell what they do? In the ranch herb dip…is it ground thyme or dried thyme? I love these!! I want to make them for Christmas gifts. I found the ornaments yesterday at Hobby Lobby but was wondering where you found the baskets? Sounds great. I have no idea on the basket. It was just an old basket my mom had. Toni, what size bulbs did you find? I used a small piece of foil like the instructions, but you can also use plastic wrap. I live in Dorset, England, where can I get these baubles??? I really love the simplicity of these gifts. 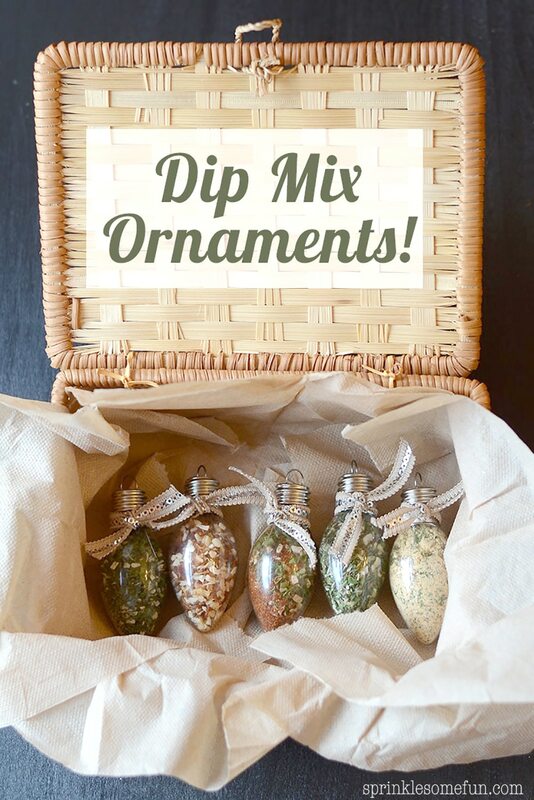 What a brilliant idea to take otherwise “ordinary” dips, mixes, lotions and more than to put them in ornaments? I think this is exceptionally creative and it seriously makes me want to up my gift giving game. Love the idea and would be great for an Ornament Swap! Helpful discussion ! Apropos if you a a form , my wife filled a fillable document here http://goo.gl/d1fZvr. I made these for my friends. They loved them. I am an Activity Director in a Senior Care facility. My high functioning residents have a craft bazaar every Thanksgiving weekend to raise extra funds for their activity programs over the holidays. It is often a struggle to find craft items that are cost effective to produce, arthritic hands can make AND are sellable….these ornament ideas are just what I needed! My residents are gonna love these and I’m sure they will sell like hotcakes! Thanks for sharing!! Question: For the Dill Mix, you include Ranch Herb Dip & Dressing Mix after the mixing instructions. Is it to be included in the additional ingredients list or is this a typo? Thanks! It’s a typo. Thanks for letting me know. It’s not supposed to be an ingredient, but it looks that way because of the bullets. I will make sure to change it. Thanks! I have subscribed to your site 2 times, I can’t download the tags could you help me download so tell me how from your web page. I am emailing you now. Thanks for letting me know! I have also subscribed for the tags 2 times but did not receive an e-mail. Could you possibly send them to me for the hot chocolate ornaments and dip mixes? Thanks! I have also subscribed to your newsletter several times to get the printable tags. I’m not receiving the e-mail either. I have bought all of the ingredients and Christmas is coming soon, I’m getting nervous. 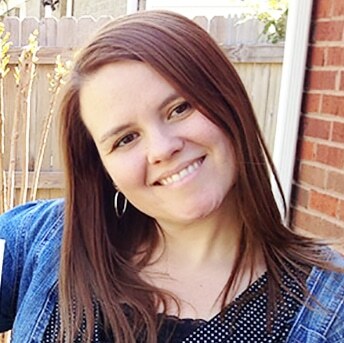 Hi Rachel, these are so darn cute, thanks for sharing such a great idea! I realize you posted this a few years ago, but was wondering when I made Italian mix it only filled bulb 1/3 of the way ( using 2 1/ 2 inch bulb. )If I triple it so it fills up bulb should I triple additional ingredients too? Thinking I should. Thanks, Jan. Yes just triple all the other ingredients. If you think that amount would make too much dip at one time then measure how many Tablespoons of mixture your ornament holds and 1/3 of that amount would be for ONE recipe. I hope that makes sense. Also, the instructions on the gift tags have exact measurements included. For example; the Italian mix says to add 1 Tbsp. of the mixture with the other ingredients. So you would just add the tag with it and it wouldn’t matter if the mixture was tripled or not. Let me know if you need help getting the tags. Instructions on how to subscribe for them are in the post. Got it, thanks so much for reply! I tried to subscribe on line and got the recipes but was unable to get the tags. Any suggestions? Kim- I tried reaching you at the email you left here, but it didn’t go through. To Kim and anyone else having problems with the printables… please email me at [email protected] and I will take care of it! Thank you! Hi Rachel, I haven’t been able to get gift tags, could you send them again. Thanks, have a great day! Cannot access the printable recipe labels. I am making the dip mix ornaments and subscribed to your website. How do I now get the free printable gift tags? Question and hopefully it makes sense. when making the dip do I use the entire bulb and add it to the additional items i.e. sour cream, mayo etc. as per recipe instructions? Hello. I subscribed but cannot get the printable gift tags. How can I print those? Hi there, I subscribed, but still can’t figure out how to print the gift tags? This is the cutest idea! I’m going to make them for my coworkers. I’ve subscribed to your blog several times, but it hasn’t sent me the downloadable tags. Am I doing something wrong? Thanks! I am going to email you at the email address you wrote this from in a minute. Be looking in your inbox! I am also having issues with getting the email for the printable dip mixes. Can you help me out? I have also subscribed 2x adn cannot get to the download of the printable tags. I’m having that problem too. I subscribed but I can’t get the tags. Hi! I have subscribed twice but have not received any e-mails for the tags. I am looking for the hot chocolate ornament tags and the dip mix ones. Thanks! Hi! I’m trying to download the tags. I subscribed but it won’t give me a link to print them. What can I do? She left her e-mail address above to send a e-mail to her if any issues. I’m having the same problem.